One of Britain’s most impressive steam engines has reached the seaside – 46 years after setting off for Swanage. British Railways decided in 1966 that Clan Line was too large and heavy to complete its journey along the Swanage branch. But last week, the engine proved the old state rail network wrong and completed its long-awaited journey without incident. The Swanage Railway line is a delight. 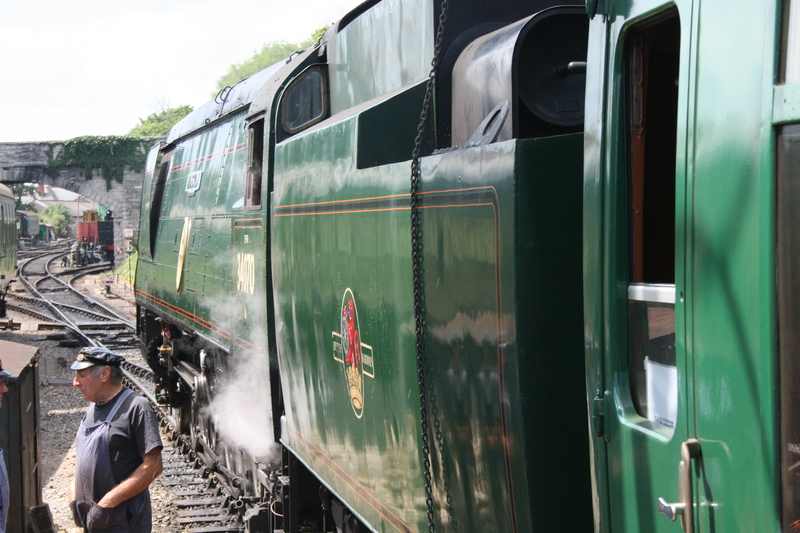 We visited in 2009 when Owen was approaching his first birthday, and took a return trip from Norden to Swanage the following year behind Manston, a Battle of Britain class pacific. The line revels in its LSWR and Southern Railway heritage. And it’s wonderful to reach the seaside by steam. One last thought. The Southern was our most modern railway, with its extensive electrified network, yet provided London’s last steam express train service until 1967. The steam engines now visiting Swanage were those that took Londoners to the coast in the era of the Beatles and the Rolling Stones. This entry was posted in Railways, Transport and tagged Clan Line, Eddystone, Manston, Southern Railway, Swanage Railway by Rob Skinner. Bookmark the permalink. The volunteers down there work very hard and all there time and effort has created a great product.